Excerpt from Almanach der Kaiserlichen Akademie der Wissenschaften, 1859, Vol. 9 Die P. T. Herren Mitglieder der ksiserl. 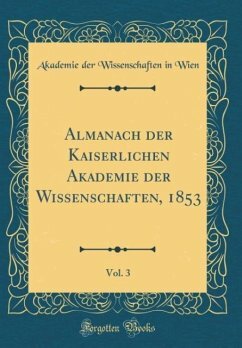 Ahdemie der Wis sensct werden hö¿ichst ersucht, die fiir den Almsnsch bestimmten Personnlnotizen gefälligst un die Ksnzlei der kaiserlichen Ahdemie einsenden zu wollen. Do. Dieser Alma nsch noch der feierlichen Sitzung am 80. Mai angegeben wird, so ist es wünschenswert}: dsee alle Mittheilungen ling. About the Publisher Forgotten Books publishes hundreds of thousands of rare and classic books. Find more at www.forgottenbooks.com This book is a reproduction of an important historical work. Forgotten Books uses state-of-the-art technology to digitally reconstruct the work, preserving the original format whilst repairing imperfections present in the aged copy. In rare cases, an imperfection in the original, such as a blemish or missing page, may be replicated in our edition. We do, however, repair the vast majority of imperfections successfully; any imperfections that remain are intentionally left to preserve the state of such historical works.